Hmm...chiming in fro, having watched it live, I'll say this. Live better than TV: Brezina- he has a lot of energy that carries better live, and his arm movement when seen live match very well with the music accents. His "presence" is definitely the strongest in the group. TV and live about the same: Keegan and Cha, a bit of Voronov. But Voronov does have much bigger edges live that doesn't get translated on TV. Keegan and Cha both felt about the same live as on TV. What you expect to see is what you get. Anyways.. that's just my 2 cents. I agree about Brezina, he's very charismatic. I thought Shoma is better live personally. I don't think I quite appreciate his upper body movements as much on TV. Nathan's jumps are better live I thought, the rest are better on TV. ACI this year was my first time watching live competition. Jun’s FS was one of the highlights! Yuzu is even more impressive in person than TV (as if that is even possible!). He was so fluid and fast; it was very very noticeable even in practice. When I saw his first triple axel in practice (the twizzle one in Otonal right in front of the judge’s panel) my heart popped out of my chest because it was so huge! And I almost cried on the spot during the Otonal step sequence during the SP (when he was in costume the feeling gets enhanced compare to practice, and I was standing at the top on the jusge’s side so I got the whole impact of the speed and flow). But once again watching a competition without Yuzu when he was supposed to be there makes me miss him more, especially knowing that he would have wiped the competition. 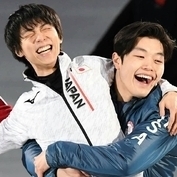 I guess we can together and go watch some more of Yuzu’s performances on YouTube....I watched GPF Seimei last night. Sorry for going off topic....this is supposed to he GPF 2018 Men’s thread which I have turned into a “I miss Yuzu” thread! Starting to look through these protocols in order to add them to my judging database and what are some of these judges smoking (well, I guess it is Canada ), Nathan #1 in PCS, seriously? and the french judge put Shoma 5th in the SP for PCS?? ?